A 24 million dollar loss in the art world has been replaced in the news by a one billion dollar find. Just weeks ago, the art world was lamenting the theft and probable burning of seven works of art from the Kunsthal Museum in Rotterdam. Now comes a new report of the German find of over 1400 artworks in an apartment owned by an eighty year old man. The pain of loss is overcome by the joy of the new find. But the antics of the theft ringleader are quite entertaining. And insulting. The Romanian ringleader of the art heist gang first attempted to have his trial moved from Romania to the Netherlands in hopes of a more lenient sentence. His bargaining chip was the promise to reveal the location of the art in exchange for the trial move. However, his loving mother may have nixed that plan when in an attempt to save her son, she stated she had burned them in her stove. The ashes in her stove have been confiscated and are being analyzed. She, apparently, didn’t have enough sense to get rid of the ashes, too. Forensic capabilities may have uncovered evidence that proves she did, in fact, burn the art in spite of a latter retraction. When the trial move was denied, the ringleader’s next trick was to claim the museum had been complicit in the theft to benefit from an insurance claim. Or perhaps, it was the owner of the collection who was complicit. “Somebody”, claimed the thief, made the heist possible so “somebody” could get the insurance money. “Somebody” or “anybody” but the thief is responsible for the thief’s actions. He is certainly not responsible. He’s a good boy. Just ask his mother. And if that wasn’t enough, he continued to add insult to injury. When the insurance claim idea was denied, he then threatened to sue the Museum, claiming it was the museum’s fault he stole the works because the museum’s security was not sufficient to prevent his theft. Essentially saying, “Its your fault I stole from you because you were not strong enough to stop me.” The sound of heads shaking can be heard. One wonders who is paying the lawyers to file this claim? However, the pain of the theft was deeply felt by the art community and compounded by the continued brazenness of the ringleader. But all is not lost! The stolen Matisse and Picasso artworks were replaced in the heart of the art community by the newly found Matisse and Picasso artworks. The German find is many times larger than the Dutch theft. Will the thieving ringleader or his loving mother take credit for the find? Who cares? His fifteen minutes are over. Hope that Romanian prison food is tasty. Note: The thief’s name has purposely been withheld in compliance with the fifteen minute rule. The Dutch Heist and the German Find have been covered extensively by The Guardian. Read more here and here. The Scotsman, the BBC, The Claims Journal, CNN, the New Yorker and more have all written about various aspects of the theft and trial. Follow the links for more on this intriguing story. Update and a second fifteen minutes: The Ringleader and one of his accomplices have been sentenced to six years and eight months in prison. The ringleader’s mother is also soon to stand trial for her role in the possible destruction of the art. Hopefully, she will see a similar sentence. Couldn’t happen to a nicer family! Unfortunately, mom’s trial will add another fifteen minutes of fame to this thieving bunch. 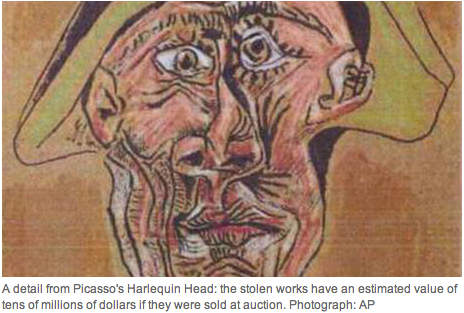 This entry was posted in art, art education, art museums, art news, education, Painting, Uncategorized and tagged Art theft, Kunsthal, Museum, Netherlands, Picasso, Rotterdam, Theft. Bookmark the permalink. How interesting–and dastardly! The professor is quite happy that you keep him updated on such news.